Sell Surface Pro 3 i7 | How Much is My Surface Pro 3 i7 Worth? 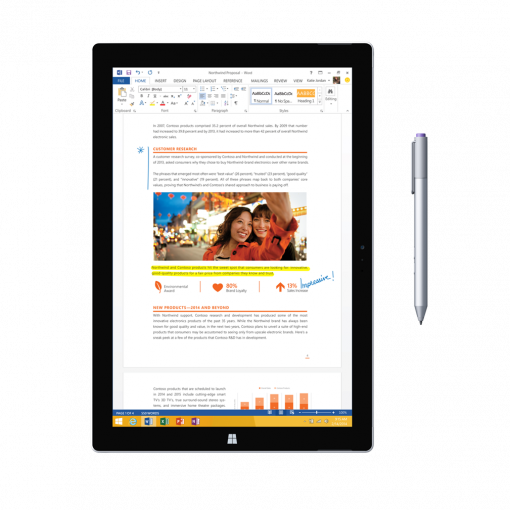 How Much is the Surface Pro 3 i7 Worth? The Surface Pro 3 i7 is worth $255 to $325, depending on the storage size and condition of the device. *Price subject to change. Quote in dropdown is final. Get Cash for Your Surface Pro 3 i7 today! Select the information above in order to receive an accurate quote for the Surface Pro 3 i7 you want to sell. Click sell item if you agree with the price that is displayed. GreenBuyback purchases tablets, and laptops at the highest prices in the industry! When you sell your device to GreenBuyback you will never have to pay for shipping. GreenBuyback is dedicated to maximizing the cash back to our customers. All quotes outlined above are good for 30 days at checkout. Once you have completed the checkout process simply print the shipping label, box your item(s), and ship them free of charge to us. The faster you ship the item(s) to us the quicker you get to get paid! The Surface Pro 3 i7 is thinner and lighter than the previous two iterations. The display gets an upgrade at 12 inches and has a higher screen resolution. The kickstand makes the Surface easier to use and the keyboard remains best in class. Selling a Surface Pro 3 i7 is so easy with GreenBuyback; send your Surface Pro 3 i7 to GreenBuyback with free shipping and you’ll get cash sent to you fast! The Samsung Pro 3 i7 is an excellent alternative to a laptop. It is Microsoft’s best PC to date! An excellent option for busy on-the-go business owners or world travelers looking to lighter their load. GreenBuyback will buy your Surface Pro 3 i7 in any condition, even broken! Simply head to GreenBuyback to get a quote, send your Surface Pro 3 i7 in, and get cash quick!